When you want to lounge and relax outside, pull up to the Vistano 5-piece Club Chair, Ottoman and Side Table group. Sit back onto the deep club chairs and kick your feet up onto the over-sized ottomans. Chat and hang outside with your mate or create extra seating by using your ottomans as over-sized bench stools. Stone top, two tiered side table is perfect for drinks, games or whatever you want to keep within reach. The Vistano Collection is designed with clean lines and elegant weaves to create a classic look that will stay with you for years. 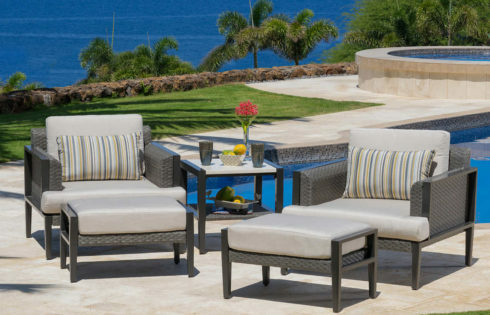 For a piece that can offer extra deep seating comfort without sacrificing durability against the elements, look no further: The Vistano Collection is the perfect statement for your outdoor patio.